This is a review of the two very popular no mess / no waste bird seed products on amazon. 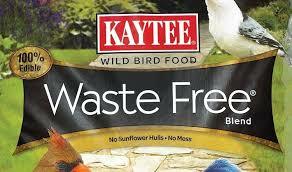 Kayte Waste Free wild bird food, and Wagner's Shell Free Blend. This Kayte Waste Free wild bird food mix is made with shelled peanuts, hulled sunflower, millet, cracked corn and canary seed. The Wagner's Shell Free blend come with sunflower chips, white millet, red millet, peanut pieces, cracked corn. All are packaged with no hulls, so that all of the seed is 100% consumable and no waste left behind. The good thing is that every part of this food can be eaten by birds that come to your feeder even if it falls to the ground. Birds and squirrels will come to pick up fallen parts under the feeder leaving your yard clean. Best "no mess" bird seed. Check Kaytee Waste Free, 10-Pound Bag here. Check Wagner's 62056 Shell Free Blend, 5-Pound Bag here. 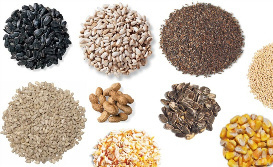 Hulled sunflower, millet, cracked corn, peanuts, red millet, canary seed, calcium carbonate. I like that the seed comes with no hulls, and no shells are produced with this no mess bird seed. Even if birds drop some on the ground, other birds will pick it up and eat it later. The mix will attract large variety of birds to your backyard. It will not sprout plants when dropped on the ground. It is great for balconies or patios as no left overs are droped on the ground. But remember when it says "no waste bird seed" on the label it means shells are removed but seed itself can still fall under the feeder. It is just that it can be eaten by birds so you dont have to clean it. This blend is great for attracting small song birds but also large birds like doves and ble jays if offered in a platform feeder. Not all of the birds eat the same type of seed, and if you don’t have all of the birds that this variety attracts in your backyard some seed can still be left uneaten. The good thing is that birds will often come to finish the job on the ground. This blends are not targeted for just one or two bird types, but will attract more variety. So if you want to target special bird species then you have to buy other seed products. What birds will it attract? Sparrows, doves, juncos, blue jays, and cardinals love to eat cracked corn. Mourning doves, dark-eyed juncos, eastern towhees and quail also eat white proso millet. Buntings. cardinals, chickadees, house finches, purple finches, grosbeaks, nuthatches, pine siskins like sunflower seed. Titmice, jays, chickadees, woodpeckers and nuthatches like peanuts. Doves, finches, and juncos like canary seed. If you offer this seed in a normal bird feeder small song birds will be attracted, and if you offer it in a platform bird feeder, larger birds like doves will be happy to come together with smaller birds. If you are looking to attract as wide variety of birds you can this is great, as long as you dont target a special bird. If you want to target your visitors, like cardinals, or just finches, then you have to get a different mix. This two products are truly no waste bird seed, and no seed will sprout under your bird feeder, no mess bird seed means no hulls over the ground. Some seed may still end up uneaten, not all of the birds eat the same food. It looks like you get more seed than in normal bags as hulls are not taking up space. It will attract large variety of birds, and is great for bird lovers who want to attract large variety of birds at the same time. I think you get a good value for the money with this one! Check Kaytee Waste Free, 10-Pound Bag here. Check Wagner's 62056 Shell Free Blend, 5-Pound Bag here.